I suffer from migraines, and along with magnesium supplements I’ve made an effort to eat more foods high in magnesium. I find magnesium-loaded foods to be helpful not only for prevention but to ease the pain during an episode (it may be all in my head, but there’s not one bad thing about a super food like quinoa, my favorite migraine-fighting food). 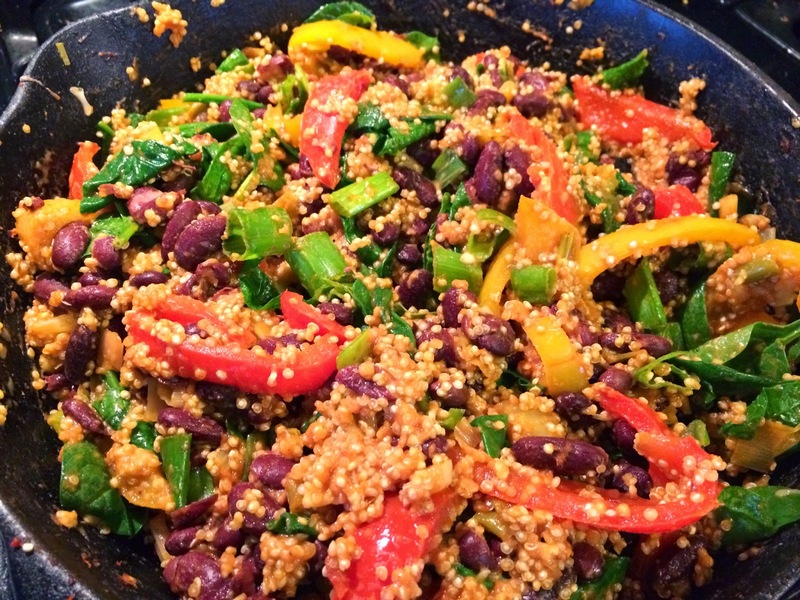 Earlier this week a migraine (thankfully short in duration, about 5 hours) led me to look for a quinoa and red kidney bean recipe. 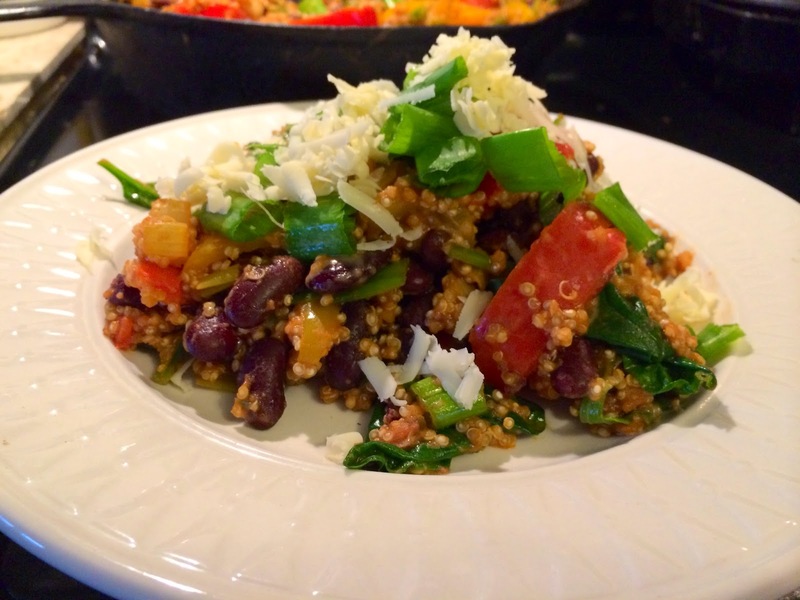 I found this Quinoa and Bean Pilaf recipe on the Food Network and modified it for fun. At first I wanted to prepare it with some lemon pepper chicken, and when I started putting it together realized this is a protein-packed meal all on its own. Below is my version complete with photos. Enjoy, and if you try it would love if you left your thoughts and modifications in the comments. Heat olive oil in large skillet over medium-high heat (I love our cast iron skillet). Add peppers, scallion whites and celery. Cook and stir until soft, which will take about 5 minutes. Add garlic, tomato paste, cayenne and about a half teaspoon of salt (I actually used a little less). Cook and stir for about 2 minutes. 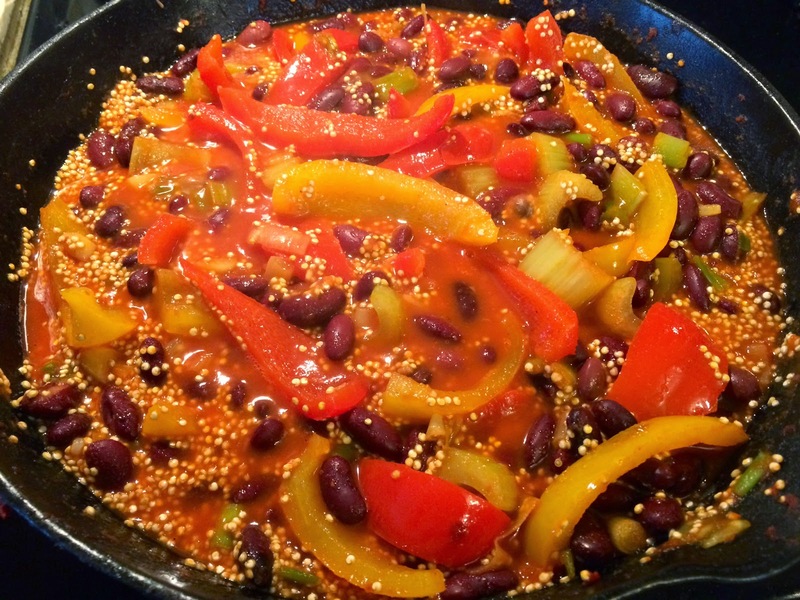 Stir in quinoa, then add two cups of water and the kidney beans. Simmer and cook, and stir often. You want most of the water to be absorbed and for the quinoa to be cooked through (should take about 15 minutes). The recipe suggests adding up to a 1/4 cup more of water if necessary, and I did need to add a little water before the quinoa was completey finished cooking. Remove the skillet from the heat and add the spinach, then stir until it starts to wilt. The recipe suggests adding 1/2 teaspoon of salt; I went easy here and just added a pinch. Stir in half of the scallion greens and the shredded cheese. 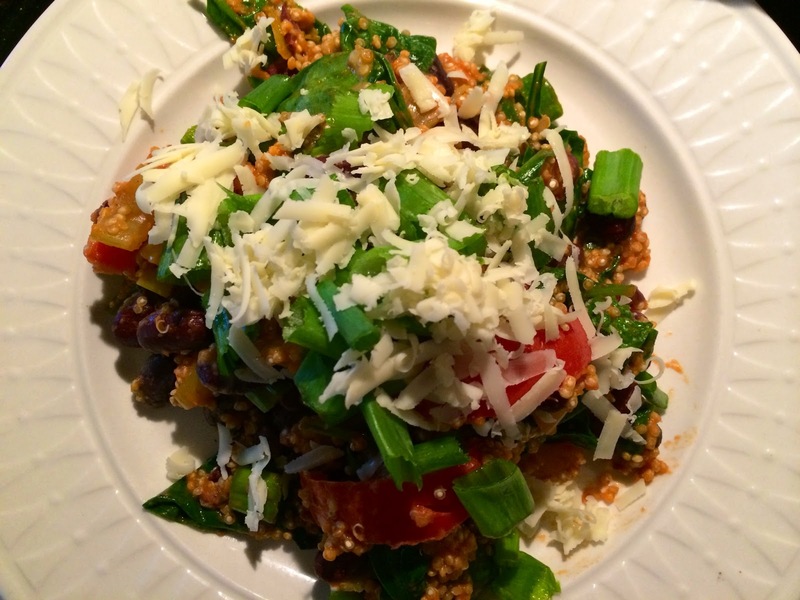 Place individual portions on plates and sprinkle the rest of the scallion greens and cheese on top. 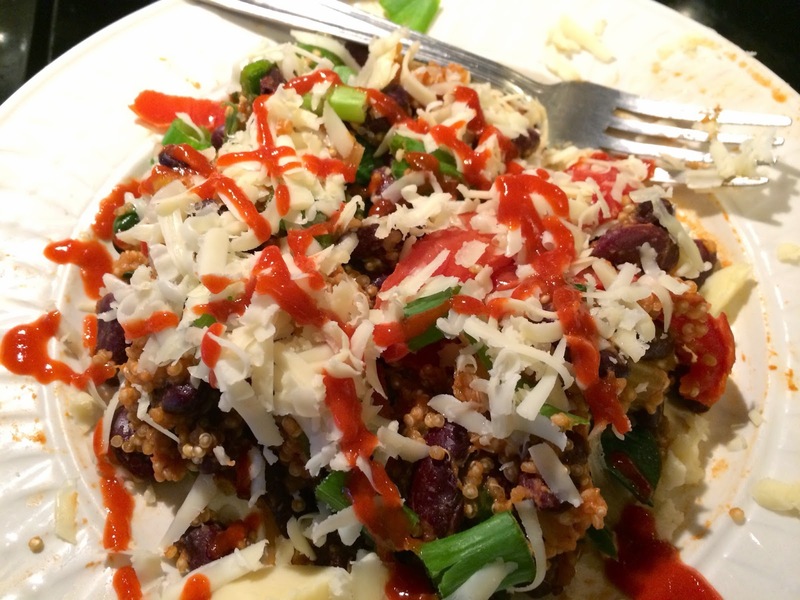 Drizzle with Sriracha sauce and enjoy!